I’m happy to announce that I have managed to complete a new plugin for the DeveloperExpress Refactor!Pro product: Refactor_MoveTypeToFileInProject. You can download a binary of the the new plugin here. Invoking this refactoring will result in the type declaration being moved to a new source file in the current project. In Test-Driven Development (TDD) we want to write a failing test first, then move on to write the implementation code that makes the failing test pass. Usually (though certainly NOT always) we tend to want to separate the projects where we are writing the tests from the projects where the production code resides so that we don’t end up deploying tests into production assemblies when the project is ready to be released. write a test in the test project; often this will include calls to classes that don’t exist, methods that don’t exist, etc. This pattern repeats itself over and over again in the TDD process and really means that if we’re writing the tests in Project A and the production code is in Project B, when we are in our test project (A) and running the Move Type to File refactoring, 99% of the time what we really want to do is move the type to a file in another project rather than the current project. With the present tools (refactorings) at our disposal we have to first move the type into a new file in the (current) test project (A) and more often than not the very next thing that we need to do is move that new source file out of Project A (the test project) and into Project B (the production project). If you look closely at the popup menu, you can see that the original built-in refactoring, Move Type to File, is still available as well. 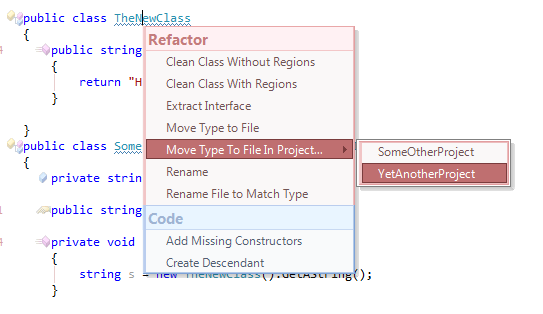 If you really want to move the type declaration into a new source file in the same project, then simply select this refactoring instead of the new one provided by the new plugin. But if you want the type declaration moved to a new source file in another project in your solution, then simply select that target project from the fly-out menu and you’re good to go. Its probably worth pointing out a (relatively) new plugin by Rory Becker called CR_DeclareClassInProject that tries to solve more or less this same problem in a slightly different (but, I think, complimentary, way). Available just as with my own Refactor_MoveTypeToFileInProject in the DXCoreCommunityPlugins repository on Google Code, CR_DeclareClassInProject solves the problem in reverse order: it enables you to declare the class in a new source file in a different project in the first place rather than first declaring it in the same project and then moving it into a new file in a new project later. I think that Rory’s approach solves the issue in a pretty clever way with CR_DeclareClassInProject and when paired with my new Refactor_MoveTypeToFileInProject, provides just about all the flexibility one might need to support more effective TDD with DXCore/CodeRush/Refactor!Pro in the manner in which most TDD-practitioners tend to work. 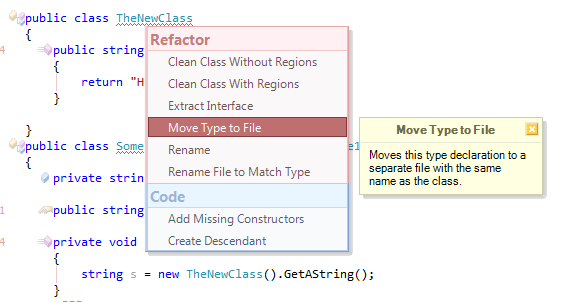 Just as with the Refactor_MoveTypeToFileInProject plugin, note that the built-in Declare Class refactoring is still available to you so if you still want to declare the class in the same project (in fact, in the same source file) then you still can do so of course. The only thing missing from Rory’s plugin is support for the other common ‘type declarations’ that .NET provides: notably interface and struct. I’m going to reach out to Rory to see if he would be interested in extending his plugin to more broadly offer ‘Declare Interface in Project’ and ‘Declare Struct In Project’ rather than just ‘Declare Class in Project’ and hopefully he will be amenable to that. If you’re interested in checking out the CR_DeclareClassInProject plugin in its present state (supporting class types only), you can download a ‘convenience’ build of the plugin from my own site here or else just grab the source yourself from the DXCoreCommunityPlugins site on Google Code and build it for yourself! …then paired with the Update to Default Namespace plugin can collectively provide a pretty comprehensive suite of TDD-centric refactorings for CodeRush and Refactor!Pro adopters. Presently I’m unhappy with the level of UNDO/REDO support that my Refactor_MoveTypeToFileInProject plugin offers (read: very little!) and so I have on my agenda to do some research into how the CodeRush API offers support for UNDO/REDO of actions like adding files to projects, etc. that aren’t all that easy to undo because they involve interaction with the file system. Until then, just recognize that the plugin doesn’t really offer first-class support for undoing its actions in an acceptable manner so any post-CTRL-Z cleanup is on you for now 🙂 so use with caution! As usual, any feedback, comments, etc. (positive –or- negative) would be welcomed! Till then, Happy Coding to all~! There is a problem. When you move the class to the project the class is moved but not placed in a namespace and no using section. Can you provide me with a sample solution that evidences this behavior? In my tests, so long as the existing type declaration (class, interface, struct) is properly within a namespace block when you invoke the refactoring, the resulting new source file does correctly place the type declaration within that same namespace block in the new source file. Its (obviously) possible that I’ve failed to correctly handle all possible situations, so could you maybe e-mail me a small solution (zipped) that evidences this problem so that I can see what’s going on –? Steve, send me an email and I’ll put you in touch with a dev from the CodeRush team who can help out with multi-file undo. markm at the dev express domain. Will-do; thanks so much for the assist~! Previous Post: DevExpress 2009.2.9 Tools Released: CR_ClassCleaner, Refactor_UpdateNamespace, DX_SourceOutliner and More!